Following her attendance at the Radio Disney awards, Skai Jackson was back on the carpet for the 2018 BET Awards this evening(June 24th) at the Microsoft Theater in LA. 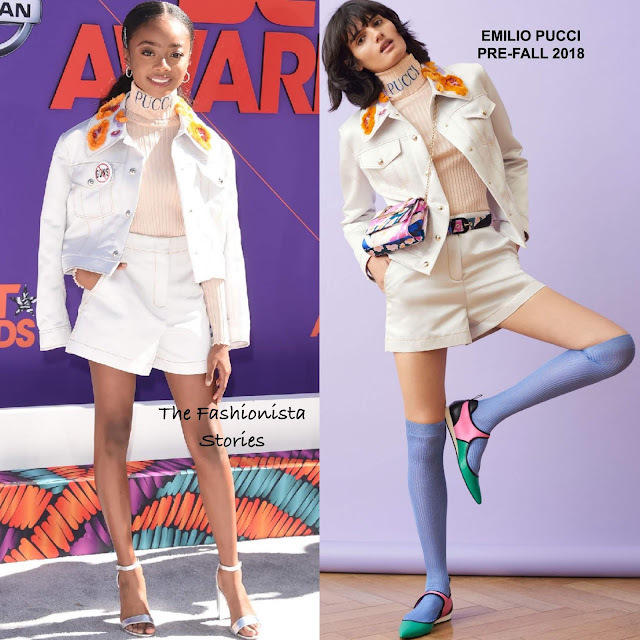 For the occasion, she wore an EMILIO PUCCI PRE-FALL 2018 ensemble which featured a white denim jacket with an embroidered collar, a pink ribbed logo turtleneck and white shorts. I think this is a cute ensemble but it's too hot for that turtleneck. A center part, curly ponytail, minimal make-up and metallic sandals finished up her look.